PITTSBURGH--(BUSINESS WIRE)--4moms®, a consumer technology company that makes high-tech baby gear, today announced the 4moms moxi™ stroller with “power on board” features for parents on-the-go. As the newest addition to the 4moms product line, the moxi stroller showcases the company’s continued innovation in the baby gear space. Parents can also download the 4moms app, which will provide a lifetime trip history, and customize fitness settings for accurate tracking of calories burned. The moxi stroller offers a range of seat configurations from a built-in bassinet for newborns and both front and rear facing positions. It is also compatible with a variety of infant car seats including the 4moms self-installing car seat which will be available this September. 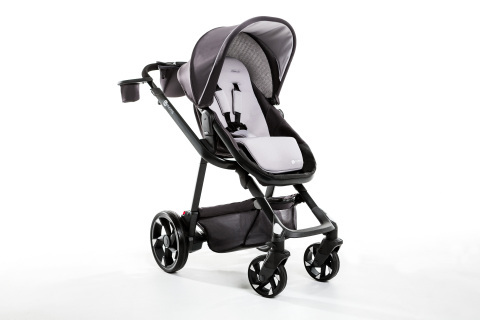 The 4moms moxi stroller is designed to be used from birth and with children up to approximately 55 pounds. The moxi stroller also comes complete with a dashboard bag, canopy with a pop-out shade, front-wheel swivel locks for rough terrain and a flip-flop friendly brake. The 4moms moxi stroller will retail for $699.99 and will available beginning in October 2016 at buybuyBaby, Amazon, select specialty retailers and at 4moms.com. 4moms® is a consumer technology company that leverages robotics, technology and innovative design to disrupt and redefine existing industries. The company has transformed the baby gear industry with products like the 4moms mamaRoo® infant seat that replicates the bouncing and swaying motions parents make when soothing their babies and the 4moms breeze® playard that opens or closes in one simple step. The company, founded in 2005 and based in Pittsburgh, Penn., has twice been honored with the prestigious Red Dot award for outstanding product design, and was recognized, in each of the last five years, by Inc. magazine as one of the fastest-growing private companies in the United States. 4moms products are currently sold at buybuy BABY, Amazon, Target and Babies R Us. For more information, visit 4moms.com. 4moms®, a consumer technology company that makes high-tech baby gear, announced the 4moms moxi™ stroller with “power on board” features for parents on-the-go as newest addition to 4moms product line.